Sigh, I swear, if I could afford it, I would dwell in Dwell! And buy all their printed everything! See how nice sheets instantly transformed our bed from IKEA? It's nothing fancy, but it makes an impact. When my mom came over to visit and she saw these, she wanted one too. So as a housewarming present to them, I got my parents the same duvet set for their room and they loved it! It also helps that the sheets are so soft on the skin. Like I could sleep in them all day. When I see our bed, I just want to jump into it. Dwell is swell. And like I said, MFO readers are special. How special? 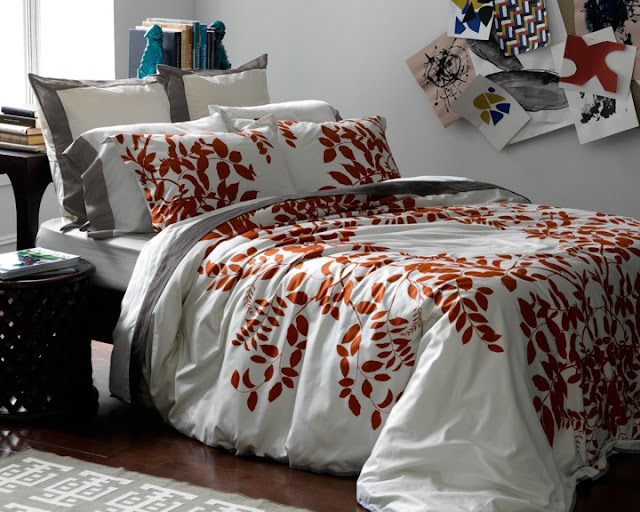 1 lucky reader will be able to outfit her bed with the DwellStudio Hedgerow Persimmon duvet set pictured on top (will fit full/queen size beds)! - Why would you like to win a DwellStudio Duvet Set? - What time do you normally sleep? - Where do you usually buy your bed sheets and home supplies? - DwellStudio sheets are the of the stuff that dreams are made on. Because dreams do come true, what dream would you want to make real? *If you would prefer to enter the giveaway via private email to me, do all of the above and send an email to manilafashionobserver@gmail.com with the title: MFO DwellStudio Giveaway and leave a comment on this post saying, "MFO, I want to dwell in Dwell!" "MFO, I want to dwell in Dwell!" MFO, I want to dwell in Dwell! >> the prints are so lovely! >> i want to tour Europe! Ey Tin ;) "MFO, I want to dwell in DWELL!" Why would you like to win a DwellStudio Duvet Set? Love the design. It reminds me of fall, my favorite season. Where do you usually buy your bed sheets and home supplies? DwellStudio sheets are the of the stuff that dreams are made on. Because dreams do come true, what dream would you want to make real? To travel the world with my little family. It's so lovely and it would certainly entice me and my little late sleeper of a daughter to sleep earlier. What time do you normally sleep? They're mostly gifts, but most of the time in S&R. DwellStudio sheets are the stuff that dreams are made on. Because dreams do come true, what dream would you want to make real? I'd like my dream to have a house with a child-friendly backyard so my kids could play and roll on the grass. - Why would you like to win a DwellStudio Duvet Set? because it is gorgeous and I wanna try it! - DwellStudio sheets are the of the stuff that dreams are made on. Because dreams do come true, what dream would you want to make real? i would like to become a makeup artist someday! "MFO, I want to dwell in Dwell! I would love to win to give my guest room a more grown up look. I would want my dream of being a full time artist to be a reality. I dream of a year-long all-expenses paid travel all over the world with family. I'd like to win the Duvet Set because just looking at the photos makes me want to just lie in bed and sleep. They just look so comfy! - SM malls got it all for me. Hehe. I'd like to be an events planner particularly kiddie parties because being around kids and all colorful stuff makes me happy. Being paid to travel around the world! MFO, I want to live in Dwell! I want to send a gift to someone who is very kind to me. I think this Set is perfect for her since she is family-woman. I adore her kindness to me. Sorry I forgot to put my twitter name and email. :) Sorry. ---> I sleep around 10pm. ---> At SM department store! ---> One of my dreams is for my family to be financially stable so that I can become a full time wife and mommy. MFO: I want to dwell in Dwell! - Why would you like to win a DwellStudio Duvet Set? >>> BECAUSE I LIKE THEIR ELEGANT DESIGNS. Because we just moved to a new apartment and new sheets would be the best homewarming gift EVER. Since I work online and don't start work until my 18-month daughter is asleep, I usually don't get to sleep until around 2 in the morning. SM Outlet stores. Lol. That's all we can afford. My dream, aside from winning this giveaway *wink*, is that my daughter will grow up having the life she deserves. P.S. I liked Quirks and MFO on FB under Angeline Rodriguez. I heard it's soft. Plus the prints are very nice. We buy them at department stores. I would like to have my own home. A place where my kids can grow till they will have their own home too. = I would love to win this oh so gorgeous piece because I only buy bed cover when it is on sale and sometimes I am tempted to buy ukay ukay too yaaaikkks, and because my daughter 3mo old sleeps with us, so wanted to win it for her to feel like a princess. = around 11pm coz we have a 3mo old baby that we have to put to sleep first. = at Sm or wherever that is on sale. = to spend quality life in the province upon retirement with my hubby and kids. 3. - I would like to win a DwellStudio Duvet Set because I want my room to look comfy. - I usually sleep around 11pm. - No particular store actually. - I would like to have my own family soon. 1. i want to win a dwellstudio duvet set so i can go home to a great looking bed. - DwellStudio sheets are the of the stuff that dreams are made on. Because dreams do come true, what dream would you want to make real? I want to start my own business. -would love to win a dwell duvet set so that i can have a good night sleep everytime! - i want to bring my whole family to Disneyland. I'd like to win the DwellStudio Duvet Set because I wanna experience luxury and comfort when I sleep. I sometimes sleep early like 9 or 10 pm. But when I have work to do, I sleep at 12 midnight. We buy our bed sheets at SM Dept. Store. To travel and conquer the world. I’m now a follower of @cd_mfo and @quirksph in twitter. Already liked Quirks Marketing Philippines and Manila Fashion Observer in facebook. - Where do you usually buy your bed sheets and home supplies? I usually buy stuff from SM home section. Thank you Ms. Christine :). Bless you. I have to admit, most of our nice sheets came from padala from abroad, but whenever my sister and I window shop at the home section of the dept. store(SM or Landmarks) I love checking the sheets selection so I guess the answer is SM (or Landmark)! I dream of winning this giveaway! Hihi. Kidding aside, if dreams do come true, my first dream is to get my dream job (+higher pay, more satisfaction, mangangarap rin lang, aim high na!) and my second dream would be to be able to sleep earlier, kasi yung eyebags ko, eh preggy na with new eyebags! Hahaha. Wow, those beds look really elegant. But I personally love the bed sheet of the second one below, pretty neat. I love the birds design.